Wyoming’s National Parks in the winter – probably the closest that modern man will come to experiencing what our planet was like during an Ice Age. We have lost some of the Pleistoncene beasts that once roamed North America; giant sloths, short-faced bears, dire wolves and mammoths. However, the Rocky Mountains are still home to impressive species of megafauna that evolved their suitability to freezing temperatures during glacial periods. 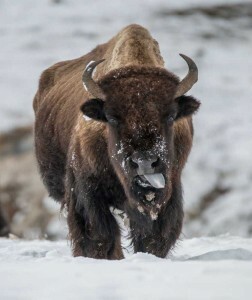 Standing in front of a herd of American bison with their heads covered in snow and condensation streaming from their nostrils, it’s not difficult to imagine a saber-toothed cat stalking through the snow to hunt their prey. The lack of human presence only enhances the feeling of stepping back in time. Unlike a summer vacation to this region, during the winter, you’ll be exploring the National Parks without traffic or crowds. Jackson Hole is a valley between the Teton Mountain Range and the Gros Ventre Range. It’s the epicentre of wildlife watching the in area and the town of Jackson is a perfect base for winter adventures with easy access to Yellowstone National Park, Grand Teton National Park and Gros Ventre Wilderness. For naturalists and photographers, the grey wolf is often the biggest draw. By 1926, humans had removed all of the wolves from Yellowstone National Park through hunting. However, thanks to campaigning from, park managers, biologists and conservationists, these charismatic canines were reintroduced using 14 individuals from Canada’s Jasper National Park. The population has now grown to approximately 100 wolves and, although sightings aren’t guaranteed, with the right guide you stand the chance of an epic wolf encounter. On my first wildlife safari from Jackson I saw two wild wolves from a distance. Even though I’ve experienced captive wolves in close proximity, nothing compares to watching their silhouettes moving unrestricted through the snow. 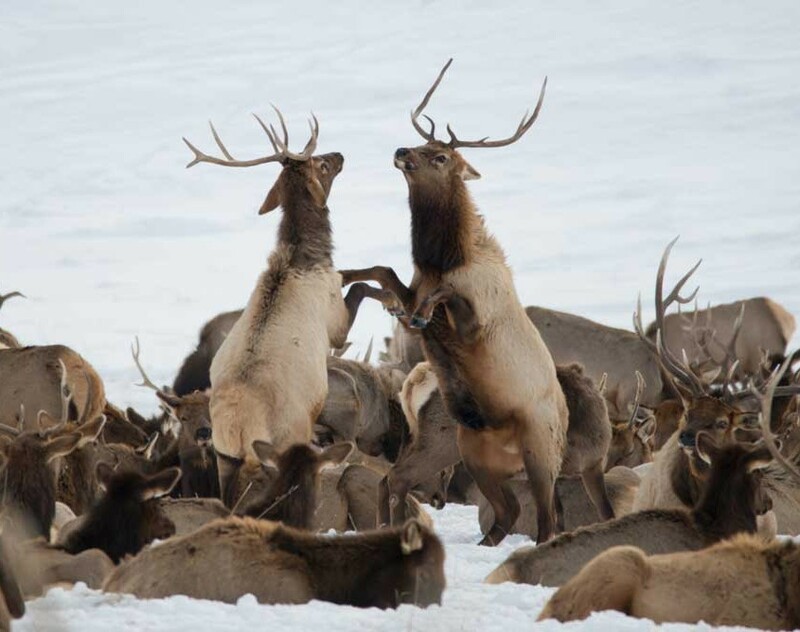 The National Elk Refuge in Jackson Hole is a prime place to visit during the winter as thousands of elk migrate here to feed during the coldest months. You can drive into the refuge to watch the herd and to spot bighorn sheep, deer and pronghorns. However, the visitors’ centre also offers horse drawn sleigh rides which allows you to get much closer to the herd. 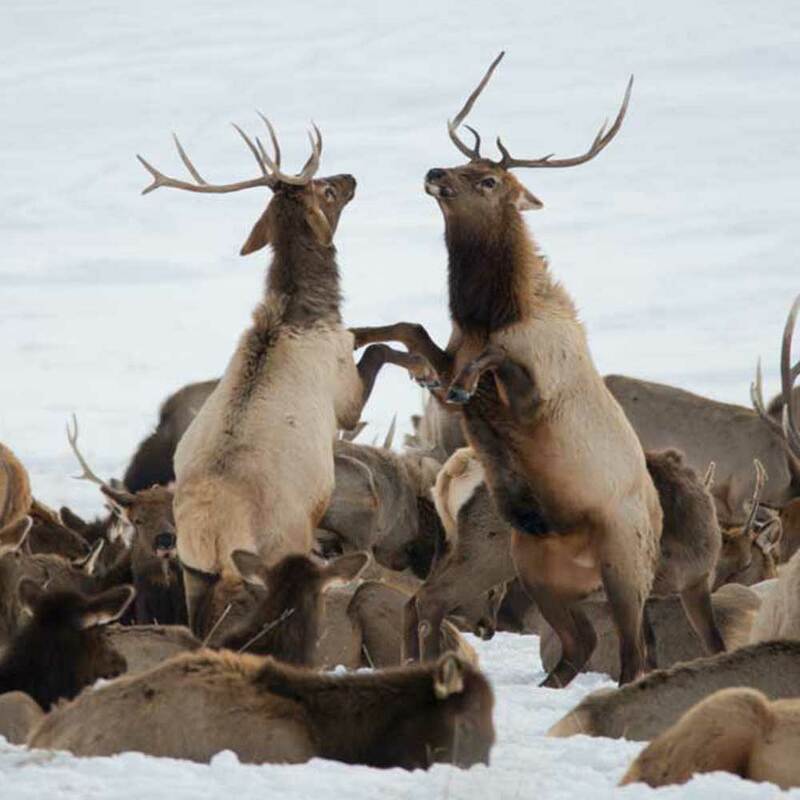 During these tough winter months, the weak, ill and old elk become food for coyotes, wolves, eagles and ravens. The best place to see moose is probably Grand Teton National Park. The locals call these animals swamp donkeys as they are normally seen eating willow at the edges of rivers. Don’t let their comical appearance fool you though, if moose feel threatened by humans coming too close, they may charge and can cause fatal injuries. With all wildlife watching, you should keep a safe distance from the animals and, if your presence is changing their behaviour in any way, you should back off. The winters are hard for the wildlife of Wyoming and expending energy to avoid humans uses up vital calories that might prevent them surviving until spring. My favourite time of day to visit this National Park is sunrise and sunset as the light that hits the blanketed mountain range is truly exquisite. Yellowstone was the USA’s first National Park and is probably equally famous for its geothermal features as it is for its wildlife. The park can only be accessed by snowcoach and snowmobile during the winter so it’s a completely different experience to the summertime traffic jams. On my snowmobile trip to Yellowstone, I had excellent encounters with bison and coyotes. 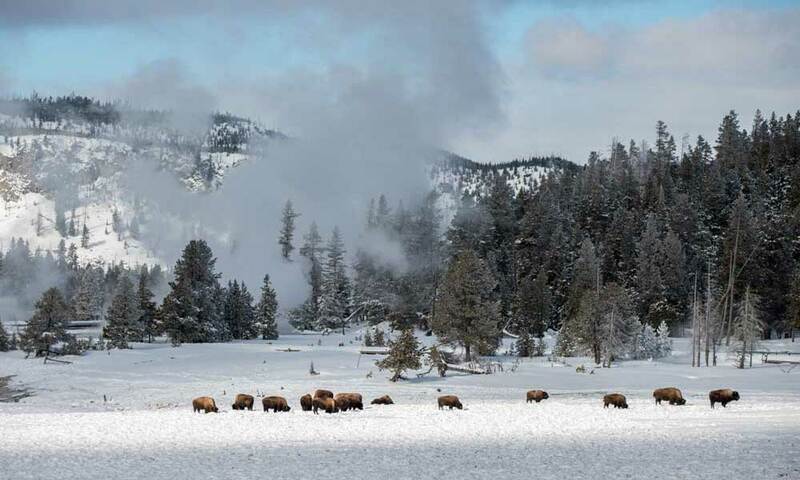 You can’t get a much more iconic scene than seeing a herd of bison in front of a steaming geyser. Old Faithful is the most impressive geothermal feature with eruptions reaching 56m in height every 35 – 125 minutes. The show only lasts 1.5 – 5 minutes so make sure your cameras are ready! Once you’ve had your fill of wildlife watching, Jackson has two mountain resorts for skiing and snowboarding. For the more serious sportsmen, Jackson Hole Mountain Resort is one of the highest in vertical drop in the U.S. For night skiing, tubing and a mountainside rollercoaster, Snow King Mountain Resort is hours of fun. I visited Jackson Hole in January and flew from London to Jackson with Virgin Atlantic (via Salt Lake City). I stayed at Spring Creek Ranch which is located on a wildlife sanctuary almost 1,000 feet above the town of Jackson and has the most spectacular views of the Teton Mountain Range. You’ll probably want to hire a 4×4 for your stay so that you can explore the area and head into town. I went on my wildlife safaris with Jason from Jackson Hole Wildlife Safaris who is not only a fantastic guide but a brilliant photographer as well. My snowmobiling tours were with Scenic Safaris and my fat biking tour was with Teton Mountain Bike Tours. A great lunchtime venue in Grand Teton National Park for views and good food is Dornan’s. A huge thank you to Jackson Hole Chamber for arranging my ecoadventure with my team.